When I was a young'n, I would hit up the Roadium Swap Meet with my grandparents on a weekly basis. I don't know why they went so frequently, or what exactly we were looking for, but I was 5 - and every time we went, I got to pick out a present - so you can image no questions were asked on my side. Most of the time - the gift I'd pick would be some action figure or back of basketball cards, but every now and then, I'd come up on a cool shirt. The thing about the Roadium is its not exactly sanctioned - so the bootlegging was in full force. The Simpsons were the hot ticket back then, so shoes, toothbrushes, candy, toys - you name it, you could find a Simpsons version of it. My personal favorite - then and now, were the un-licensed shirts. Nike, Jordan, MC Hammer - a copyright was not an issue at Roadium, so the possibilities were limitless. 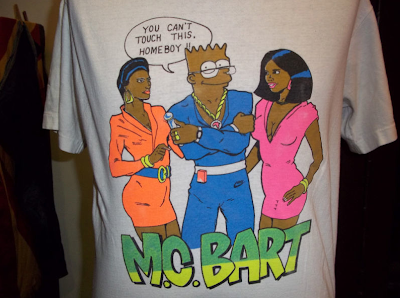 Anyway, just took this shirt over at eBay, and had to take a short trip down memory lane. Purchase here if interested.